Kerala’s ruling CPI(M)-led LDF’s Saji Cherian today won the Chengannur Assembly bypoll by a huge margin of 20,956 votes over his nearest Congress rival. According to the Chief Electoral Office, Cherian polled 67,303 votes while the Congress-led UDF candidate D Vijaykumar got 46,347 votes and BJP’s P S Sreedharan Pillai came third with 35,270 votes. 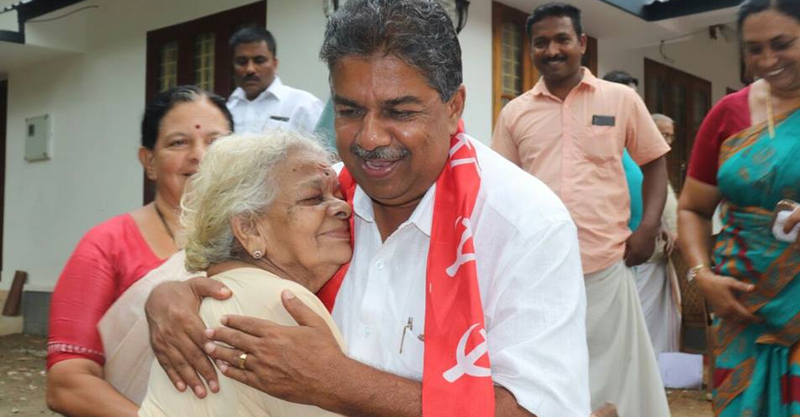 Saji Cherian, CPI(M)’s Alappuzha district secretary, had maintained a steady lead from the beginning, and emerged victorious in a hard fought triangular contest between the three fronts– LDF, UDF and NDA. The victory margin of Cherian this time was more impressive than in 2016, when the LDF had won by a margin of only 7,983 votes. It was in 1987, that the LDF candidate had got 15,703 votes. A total of 76.25 per cent of the 1,99,340 electorate had exercised their franchise in the constituency in the by-poll held on May 28. The by-election was necessitated following the death of sitting MLA K K Ramachandran Nair (CPI-M) in January this year due to illness. Reacting to the LDF victory, Kerala Chief Minister, Pinarayi Vijayan, said it was a “massive show of solidarity” by the people towards the policies and programmes of the LDF government. It was also a victory of truth over “false campaigns” against the government, Pinarayi Vijayan told reporters.The poll outcome showed that the people of the state fully endorsed the “democratic, secular values and development policies,” he added. CPI-M state secretary, Kodiyeri Balakrishnan, also said the defeat of the Congress candidate was a rejection of the “soft hindutva policy” adopted by the Congress in the constituency as it had done in Karnataka. Senior Congress leader, A K Antony, said the party will examine the reasons for the defeat and take corrective steps. The main reason for the drubbing, he said was due to the “naked communal card played by the the marxist party in the constituency.” Antony also pointed the dip in the BJP’s vote share and said UDF votes had only increased and not fallen. The by-poll victory for the LDF is a huge relief for the front as it comes following outrage and criticism faced by the government over alleged police lapse in the recent ‘honour killing’ of a Dalit Christian youth in Kottayam district and death of a man in police custody at Varapuzha. It is a sweet comeback for Cheriyan, an active political figure in the constituency, who started off as a student leader, after his defeat in the same constituency in 2006 against P C Vishunath of the Congress. The BJP that had polled 42,682 votes in the last election, had tried its best to improve its margin. The poll outcome, however, showed that once again the saffron party, with a single MLA in the state assembly, had failed to make any fresh inroads. As far as the Congress was concerned, the defeat of its candidate is seen as a setback as it was an opportunity not only to wrest its traditional stronghold from arch rival CPI(M), but also to boost morale among partymen ahead of the 2019 Lok Sabha polls. The trouncing of the UDF candidate was also a blow to the Kerala Congress(M) led by former Finance minister, K M Mani, which was maintaining an equidistance from both the fronts, but decided to cosy up to the UDF camp days before the bypoll. The fall in vote share margin of BJP in this bypoll, which managed to garner about 16 per cent of the votes in 2016, was a cause of concern. This was mainly because one of NDA’s key ally– the Bharat Dharma Jana Sena (BDJS), a political party of the Sree Narayana Dharma Paripalana Yogam (SNDP), an outfit of the Ezhava community, kept away from the campaign following differences with BJP. The month-long electioneering witnessed an unparalleled fierce campaign by the fronts, who used all means ranging from attacking each other with ‘communal cards’ to highlighting ‘achievements’ of the state and central governments to win the hearts of the voters. Senior Congress leaders including A K Antony and Tripura Chief Minister and BJP leader Biplab Kumar Deb were among those campaigned in the constituency. In 2016 election, the CPI(M) candidate Ramachandran Master had got 52,880 votes while Congress’ P C Vishnunath had garnered 44,897 votes and BJP’s Sreedharan Pillai 42,682 votes.